Welcome to Found Off The Street, our look at cars found on the cape that rust liked so much it decided to summer there; Cape Cod, MA. Today we have a special personal project car hell edition 1972 Plymouth Valiant. Two weeks ago in Found Off The Street we saw a 1968 Volkswagen Baja Bug that I was trying to talk myself out of buying. So far it has worked and I don't own a rusty red Baja Bug. This week let's take a look at the 1972 Plymouth Valiant I bought instead. The Plymouth Valiant was first introduced in 1960 as Virgil Exner's offering to the compact car segment. Besides Sports Cars, Small American Cars were pretty unheard of at that point in time. The growing popularity of the Volkswagen forced American Car companies to start thinking smaller. The Valiant was initially introduced as its own brand (Valiant by Chrysler), but for 1961 it became a part of the Plymouth line. The first Valiants were met with questionable response from the public due to Exner's daring Forward Look styling. After a complete, more conservative, redesign in 1963 the Valiant became a popular compact car, with production continuing through 1976. 1972 saw the most Valiants sold in any year (330,373) throughout the production of the car. Although they were available with small V8s, Valiants are best known for the Slant 6 engines they featured throughout their production run. The little 6 cylinder engines are thought to be one of the most durable and bulletproof engines ever produced by an American Car Company. Not surprisingly, lurking under the hood of my new purchase is 198 cubic inch slant 6. This leaning tower of power is different than most because of the fact that the previous owner actually managed to destroy it. 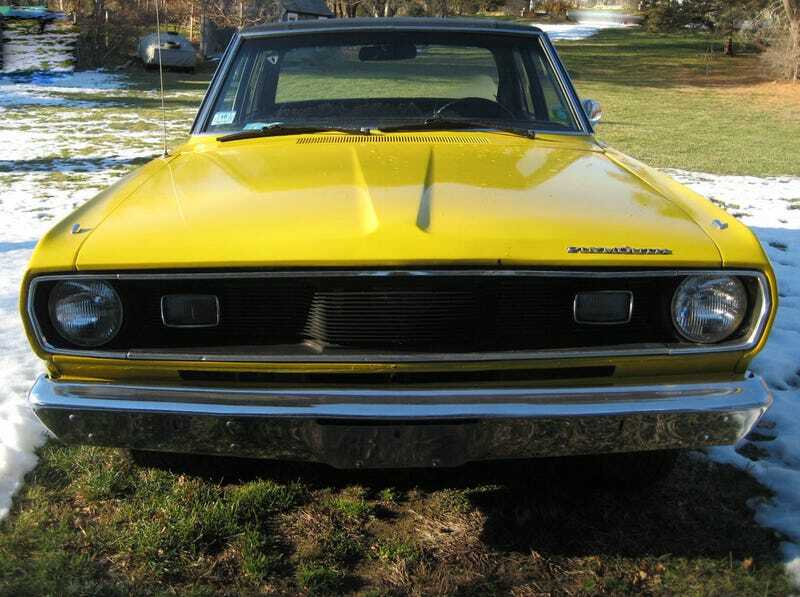 I didn't plan on buying a 1972 Plymouth Valiant that resembled a bumble bee and needed an engine when I woke up the other day. I've known about this car since a used car dealer on the Cape that rust remembered spent half of last year aggressively trying to sell the car at a pretty unreasonable price. I'm not sure whether the dealer dropped his price or the previous owner saw the car and had to have it, but one day I drove by the lot and the old yellow Mopar was gone. This summer, while I was at the wheel of my own old 4 door Plymouth, I saw the Valiant humming down the road with a couple surf boards on top. I gave the obligatory old car wave and I was happy to see that the car was being driven and enjoyed. That was the last I saw of the car until I opened a craigslist ad to see the Valiant. The price was slashed to reflect the fact the car needed a new engine and it was too enticing not to go have a look. After determining the car was rust free and the price was right, I bought the car. For about what I would have paid for a midsized flat screen TV I became the new owner of an old Mopar that doesn't move under its own power. I'm going to take the winter to decide whether to swap in another Slant 6 or start searching for a cheap 360 V8. Either way, I'm sure it will be more fun than another television.